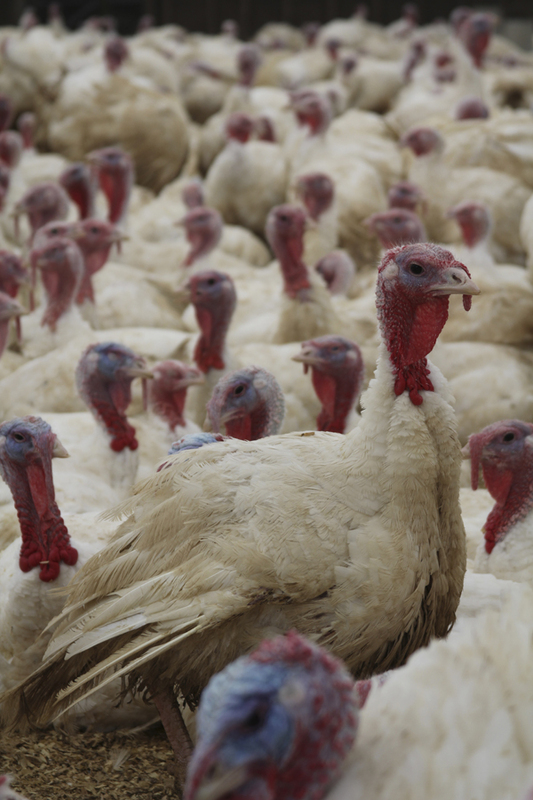 2,000 turkeys are ready for slaughter at Maine-ly Poultry in Warren. Almost all of them will be killed for Thanksgiving. A few will be saved for Christmas. 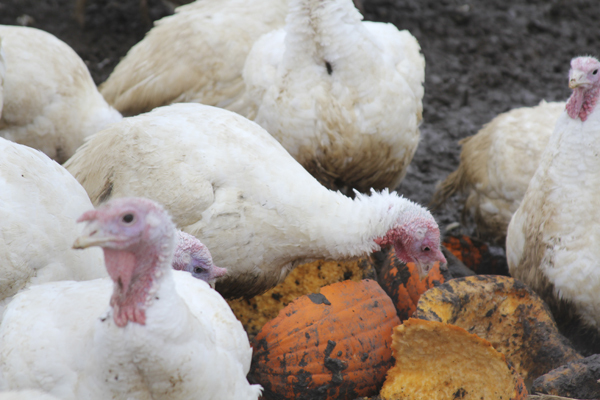 As a treat, farmer John Barnstein leaves his turkeys pumpkins to peck at his Warren farm, Maine-ly Poultry. 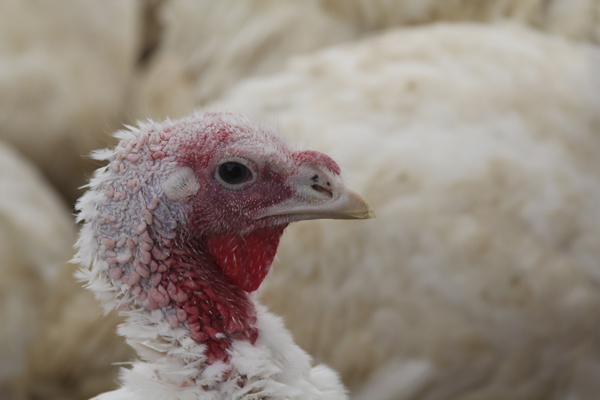 The turkeys will live for a few more days before being processed for Thanksgiving dinners. WARREN, Maine — John Barnstein dreamed of being a farmer since he was a young boy. He had seen his uncle raise cows and thought that would be interesting. When he was 10, Barnstein was hired at a chicken slaughterhouse across the street from his home in Massachusetts. Now 60 years old, Barnstein is 26 years into running his own poultry business on the side of Route 1 in Warren. This is the busy season. Barnstein will slaughter most of his 2,000 turkeys, at an average pace of about 300 a day, through Wednesday getting ready for Thanksgiving. His thought was interrupted by the phone ringing in the chicken potpie assembly room. The farmer then scribbled down the caller’s name, that she wanted a 12-pounder and what time she wanted to pick it up. By Monday, Maine-ly Poultry was sold out of turkeys. Barnstein knows most of the people who buy his turkeys. For one thing, he has lots of repeat customers and after 26 years in the business, you get to know people. Maine-ly Poultry also attends eight farmers markets a week in the summer and five a week in the winter. “It’s like people from the farmers markets — they become more friends than customers. The farmers market is my social life,” he said. One day last week, Barnstein was toiling away with four men from the prison’s work release program and three other workers he hired. They worked in a red-roof barn while turkeys outside pecked away in their 2-acre pen. Half of the pen was under a plastic roof. Inside, white, knee-high birds covered the sawdust and dirt floor, twittering away. A pungent smell wafted from the birds’ home, where they had lived since July 1, when they were brought to the farm as 1-day-olds. Some of the turkeys — all with bright red and blue heads — wandered outside to peck at a pile of pumpkins Barnstein left for them. His birds are free to walk around but aren’t considered organic because Barnstein doesn’t feed them organic grain, which he said is too expensive. He does think his turkeys are more healthful than a grocery-store frozen bird, though. He doesn’t use antibiotics, he doesn’t keep the dead birds in chlorinated water and he doesn’t package them in saltwater. Plus, they’re slaughtered just days before the holiday. “The fact that it’s fresh makes a huge difference,” he said. Because of this, he can charge about $3 per pound for his turkeys, which range in size from 12 to 30 pounds. This is about the same price as most locally raised birds, he said. The cooperative extension advises people to buy a fresh bird one to two days before cooking it. Barnstein’s poultry operation raises chicken broilers year-round and turkeys for the holidays. Products prepared on the farm for sale include chicken pies, sausage and salad as well as smoked chicken. The items are available for sale at the farm and several farmers markets each week. In discussing his work, the farmer said he prefers turkeys over chickens. If he didn’t love the birds and waking up at 4 a.m. and the plucking and making chicken potpie, he wouldn’t do it. “I love it. I always wanted to be a farmer. It’s a labor of love. Believe me: I don’t make much money off it, but if you can do what you want with your life, it makes life that much better,” Barnstein said.